Silicone hoses, reducers and elbows connect the intake pipes and tubes in diesel-powered vehicles and equipment. They’re molded from silicone rubber, an elastomer that withstands extreme temperatures and resists hardening and cracking. With silicone hoses, vehicle and equipment manufacturers can source coiled lengths and cut them to size. Manufacturers can also work with a custom fabricator who provides pre-cut lengths along with design assistance and guidance about product selection. If you need silicone connectors, there’s plenty to consider. 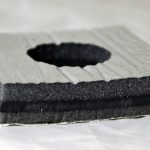 In this technical article from Elasto Proxy, you’ll learn about applications, product types, liners and reinforcement materials, and industry standards and approvals. 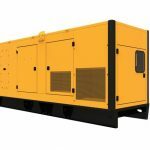 In addition to product selection, we’ll consider the importance of proper cutting for ease-of-assembly, labor efficiency, and reduced material waste. 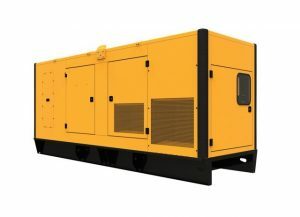 Applications for silicone hoses, reducers and elbows include trucks and buses, cranes and bulldozers, farm and forestry equipment, generator sets (gensets) and military vehicles. Silicone connectors are also used in mining, marine and aerospace applications. Understanding the complete application environment is essential. For example, what’s the range of temperatures that your silicone hose must withstand? Is there contact with chemicals? Do you need a hose that can withstand vacuum pressures? To choose the right products, you’ll also need to understand the differences between them. Silicone hoses serve different functions than silicone reducers or silicone elbows. There are different types of silicone hoses, too. Plus, silicone reducers and silicone elbows carry their own specifications. Different suppliers may use different terminology, but there are five basic types of silicone connectors. Silicone elbows contain a molded bend (the elbow) and provide excellent flexibility. Typically, the angle of the bend is either 45° or 90°. Dimensional specifications include wall thickness, inside diameter, inside radius, and the lengths of legs 1 and 2. Silicone reducers or silicone reducer hoses provide for a transition between different pipe or tube sizes. Consequently, one end of the silicone coupler is larger than the other. Dimensional specifications include hose inside diameter, hose outside diameter, and length. Straight silicone hoses come in various lengths and can be cut-to-size either in-house or by a custom fabricator. Straight hoses support the use of metal clamps and may contain fabric reinforcements. Hump hoses support slight intake adjustments and bends. They can also compensate for minor misalignments between metal pipes or tubes. Applications include air metering, throttle body assemblies, and inlets and outlets. Wrapped hoses provide enhanced pressure resistance. If you need a high-pressure hose, remember that burst pressure is four times the working pressure. If you need a silicone vacuum hose, you’ll need a reinforced hose instead. For especially demanding applications, molded silicone hoses are available with different liners and reinforcement materials. Here are some common types. Fabric reinforcements typically use polyester or aramid in a four-ply construction for added strength and high-temperature resistance. Metal wire reinforcements help to protect silicone connectors from extreme pressures, including vacuum pressures that can cause silicone couplers to collapse. Liner materials impart specialized properties. For example, a fluorocarbon liner can enhance a silicone connector’s resistance to residues from petrochemicals. Heavy-duty OEM requirements may also apply. Manufacturers who order coils of silicone hose can cut them in-house, typically with a razor blade, to achieve the desired length. This may seem cost-effective until you consider your true costs. With skilled workers in short supply, there’s an opportunity cost with every labor operation. Plus, if you’re asking higher paid employees to cut lengths of rubber, you’re adding greater direct-labor costs to projects. Material waste could be higher than you realize, too. Lengths of hose that are cut too short can end up in the trash. Lengths of hose that are cut too long may not fit readily and can require additional assembly time. 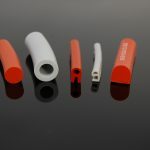 By working with a custom fabricator like Elasto Proxy, however, you can source the right silicone connectors and get added value that saves you time and money. Previous PostWhat’s the Best Sound Absorbing Material for Heavy Equipment?